To turn on your Galaxy Tab, press and hold the Power Lock button. After a few seconds, you see the word Samsung Galaxy Tab 10.1 and then some hypnotic animation. The Tab is starting. Eventually, you see the main unlock screen. Use your finger to slide the Unlock button outside the unlocking ring. After your Galaxy Tab is unlocked, you can start using it — and, unlike the first time you turned the thing on, you aren’t prompted to complete the setup routine. The unlock screen you see when you turn on (or wake up) the Tab isn’t a tough lock to pick. In fact, it’s known as the Not Secured option in the Set Lock Screen window. If you’ve added more security, you might see any one of three different lock screens. 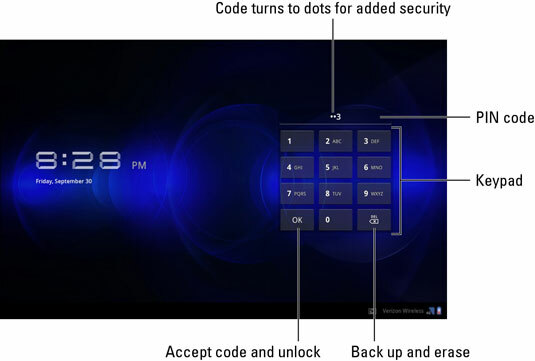 The pattern lock requires that you trace your finger along a pattern that includes as many as nine dots on the screen. After you match the pattern, the Tab is unlocked, and you can start using it. The PIN lock requires that you input a secret number to unlock the Tab. Touch the OK button to accept input, or use the Del button to back up and erase. Finally, the password lock requires that you type a multicharacter password on the screen before the Tab is unlocked. 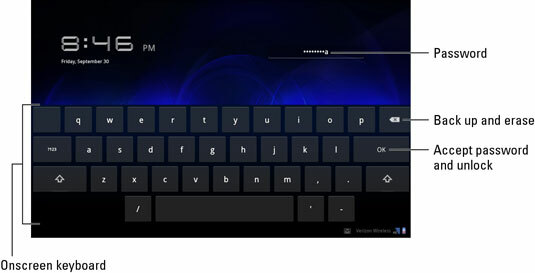 Touch the text box to see the onscreen keyboard and type the password. 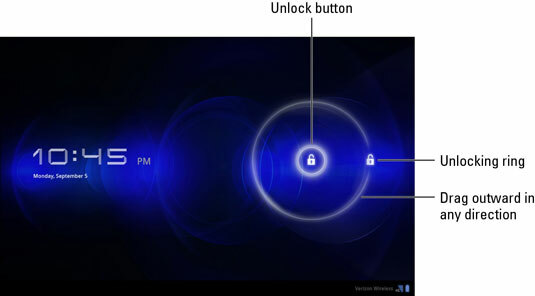 Touch the OK button to accept the password and unlock the Galaxy Tab. Whether or not you see these various lock screens depends on how you’ve configured the Galaxy Tab’s security. The pattern lock can start at any dot, not necessarily the upper-left dot. The password lock must contain at least one letter and number, though it can also include a smattering of symbols and other characters. You probably won’t turn on your Galaxy Tab much in the future. Mostly, you’ll wake the gizmo from an electronic snooze.